There’s a new character at Syracuse University, thanks to the efforts of two staff members at SU’s Early Education and Child Care Center (EECCC). 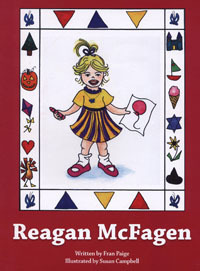 Fran Paige, an assistant teacher at the center, is the author of a new, self-published children’s book, “Reagan McFagen,” which chronicles the adventures of a precocious young girl who likes to draw. Susan Campbell, also an assistant teacher at the center, is the illustrator. This is the first book for Paige, who has spent her career working with young children and has been with EECCC for more than 10 years. “I have always enjoyed writing stories—first for my children and now for my grandchildren,” she says. Paige “debuted” the book with EECCC toddlers and preschoolers, and the preschoolers chose the cover image from among Campbell’s illustrations. “The most rewarding part for me has been the reaction of the children,” Paige says. Thanks to a wide network of friends and family, the book—which Paige describes as “a simple story with a surprise ending”—has now “traveled” across the United States and abroad, including to Arizona, Colorado, Oregon, Texas, Florida, Georgia, North Carolina, New Jersey, Vermont, Ohio and Illinois, as well as Egypt, Ireland and Thailand. A book signing with Paige and Campbell will be held on Wednesday, Dec. 1, at the annual Faculty and Staff Holiday Gala at the Syracuse University Bookstore from 4:30-7:30 p.m.
“Reagan McFagen” is available for purchase from the Bookstore—in store and online. Copies can also be purchased by contacting Paige at frantpaige@aol.com.